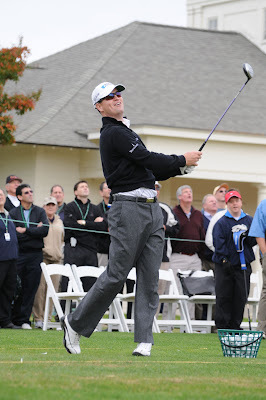 2009 WAS GOOD to Zach Johnson. The Iowan won twice and finished fourth on the PGA Tour money list. His scoring average was under 70 and he had 10 top-10 finishes in 27 events. Zach also played on the victorious U.S. Presidents Cup team. Johnson, 33, has six PGA Tour wins, including the 2007 Masters, and one Ryder Cup appearance in a pro career that began on the Prairie Golf Tour and progressed to the Buy.com Tour (now the Nationwide Tour). He played collegiate golf at Drake University because he didn’t have the game for big-time college golf programs. Zach was the same good guy in person that I’ve seen on TV. I don’t think he has a negative bone in his body. He answered my questions between signing autographs and standing for photos with amateur teams on the 10th tee of Pinehurst No. 8. ARMCHAIR GOLF: I was looking at your  numbers. I knew you had a great year. What was the difference for you this year? ZACH JOHNSON: Certainly, to compete out here and be in contention you’ve got to putt well. I putted well most of the year. That’s probably what took me into those stats that you were talking about. My game was pretty solid all around. The parts of my game that were not very positive going into the year I’m continuing to try to raise. My consistency was good. I think I missed three cuts, and I just really never took myself out of it. I’m proud of that, but at the same time the best part about it is I know I can improve. There are still a lot of goals out there and still a lot of things to accomplish. I’ve got a great team. Certainly, my sponsors, but my coaches are fantastic. They trust me; I trust them. ARMCHAIR GOLF: That seems like that’s a real theme for you, the whole team concept. ZACH JOHNSON: No question. I’m the one hitting the shots, but there are a lot of people helping me out. ARMCHAIR GOLF: What’s it been like for you to be associated with RSM McGladrey and this event? ZACH JOHNSON: As a professional athlete, you have the opportunity to associate yourself with individuals, with companies, and I’m very selective in that. I want the right mix. I want people and companies that treat their job the way I treat my job and have the same values and ideals that I have. From day one, it’s been a perfect fit. The whole slogan with their golf division, if you want to call it that—Natalie, Chris and myself—is Team McGladrey. And it is just that. And I think even beyond that, the team has turned into a family. That’s what I respect and I feel privileged and honored to be a part of. You can tell the way they go about their business is exactly how you’d treat your family or your friend or your closest people. It’s been great in that respect. As far as this event goes, it’s a staple of my schedule. I love it. You have individuals from all around the United States coming to play golf at a world-class facility under [RSM] McGladrey and the PGA of America, and it’s just fun. They get to play three classic golf courses here at Pinehurst. So you have the history involved. Being here and seeing their energy and seeing them compete, it just fuels us a little bit. I like seeing that energy and seeing that fire these guys have. ARMCHAIR GOLF: I was watching you at the Presidents Cup. I know it’s not the Ryder Cup, but it seems like that kind of event really gets your juices flowing. ZACH JOHNSON: I love team sports. We play such an individual game. Aside from my caddie, I really don’t have a teammate out there, inside the ropes. So having a team element brought into golf, that chemistry, that camaraderie that comes with it, just makes it that much more special. Then you throw in the fact that you have your nation’s flag on your sleeve, and it makes it even more special. ARMCHAIR GOLF: You feel like you bear down a little bit more when you’re playing with a guy and he’s depending on you? ZACH JOHNSON: Oh, yeah. I try to. You’re going at it together; you’re going at it as one. I think it’s just a lot of fun that way. ARMCHAIR GOLF: How has it been for you serving as a player rep on the tour policy board? ZACH JOHNSON: It’s been great. I’ve only done it one year. This is my second year in 2010. I’m learning about the tour. I’m learning about the inner workings of exactly what takes place. There’s nothing that’s a secret. It makes me proud to be associated with such a great entity, because they’re very thorough and they give a lot back. Great post, as always. I had a chance to meet Chris DiMarco at the Children's Miracle Network Classic. A hell of a nice guy. Too bad he got off to a slow start in 2010. I'm glad his luck turned up with that victory at the Crowne Plaza Invitational. I think that's his 7th PGA tour win. The Southernmost Course in Continental U.S.
Hall Monitor: Is Monty Worthy? How Does Winter Affect Your Golf Game?